It all started with some RaspberryPis..
At our system engineering course in winter term 2015/16, I worked on a project along with two fellow students of mine. In short, our goal was building a Docker cluster consisting of several RaspberryPis and an Intel NUC from scratch. Although putting that into practice turned out to be more difficult than we thought at the beginning, we finally succeeded. In case you’re interested in the details of what exactly we did and how it’s been going, you can start here. After we had finished, it came to my mind that simply leaving it to that without even having made use of our new platform would be a pity. After having put so much effort in getting the Pi cluster up and running, I really wanted to see this thing in action. Roughly at the same time, I focused on microservices as well as the Netflix’ open source stack in the context of our Ultra Large Scale Systems course. Due to their special requirements, Netflix built and published many in-house tools which drive their scalable and highly available service infrastructure. So why not set up a tiny distributed applications in order to see these things in action? On top of that, why not integrating this into a small CI/CD cycle for testing purposes? To me, this seemed like a reasonable project that could directly be built on top of our existing RaspberryPi cluster. The cluster I started off with was made up of six RaspberryPis (version 2, Model B), running Hypriot version 0.6 “Hector”. As a cluster manager node, we additionally set up a Intel NUC with the (at this time) latest Debian “Jessie” release. This mini computer was intended to act as the cluster workhorse, running all the central services which are essential for cluster management. This basic architecture can be viewed in figure 1. On top of our self-made “cloud platform”, we ran a Docker swarm with every node having Docker Engine version 1.10 installed. Notice that our cluster does not use the new Docker Swarm mode which has been released with Docker 1.12, but instead relies on the legacy swarm implementation. I will come back to the differences and how this influenced my project later on. Figure 1: Target platform consisting of a Intel NUC as the "cluster manager" as well as a Pi cluster of "workers". Service Discovery Pattern: This pattern plays an important role in distributed systems as it allows as to keep our services loosely coupled from each other. What that means is that any service A, which depends on a second service B, should not be statically bound to B’s physical network location (i.e. IP address and port). Instead, A should be able to “lookup” B by means of a logical name as soon as it wants to make a request. For that purpose, an additional service is needed which keeps track of B’s network address and makes it accessible via an unique name. A service that fulfills these requirements is what we call a “Service Discovery”. Load Balancing: When load becomes heavy, a single instance of a service running on a dedicated host might not be capable of serving all the incoming requests. In order to prevent a server from having to handle too much work and going down in the worst case, load should be split across a sufficient amount of replicas, which do exactly the same thing. Load balancing can be implemented either on client or server side, and also on different layers of the network stack. 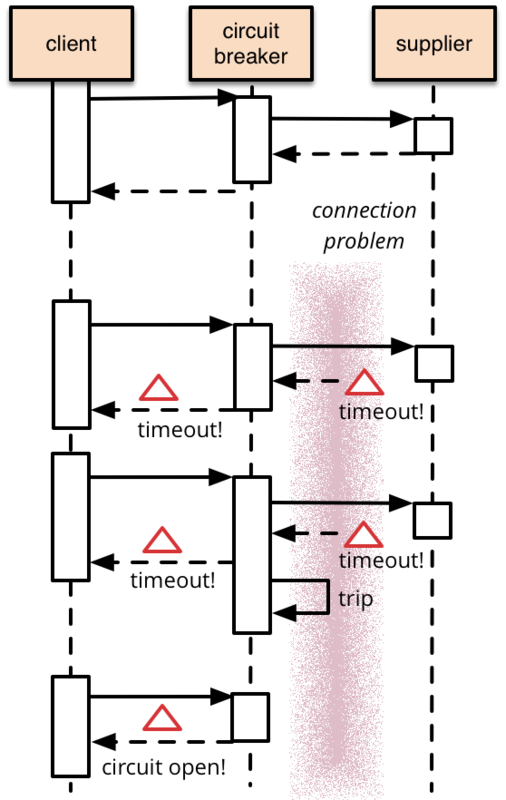 Circuit Breaker Pattern: In a distributed systems environment, every component can fail at any point in time. Coming back to our exemplary services A and B, imagine what would happen if B has crashed or continuously responds very slowly. When relying on a blocking communication protocol (like HTTP) with single-thread-per-request servers, it would not take much time until a large amount of A’s threads keep waiting for B to respond. Since the server process inflates because it is unable to free any resources, it will finally get killed by the operating system. As a consequence, we need to design distributed applications in a way that they can survive scenarios where other services are unavailable. By integrating a “circuit breaker” into our applications, the system is able to deal with unexpected failures of remote services and becomes “resilient”. In the next section, we will take a short look at what the application I developed looks like. With that in mind, we can move forward to the frameworks and tools which provide an implementation of these patterns and see how these can be leveraged to provide an app with real resilience. Weather Consumer Service: The consumer service constitutes the entry point into the application. It provides a simple GUI which takes a zip code as well as an optional country code as user input and subsequently sends a HTTP GET request to a producer service which responds with the desired data. After the response has arrived, the result gets displayed on the GUI. Figure 2: Weather app entry point. Weather Producer Service: This second component of my application is the actual workhorse which receives HTTP requests from the consumer service, contacts the OpenWeatherMap service, tailors the response to a subset of information and finally sends it to the consumer service in JSON format. Believe it or not, this is a fully functional web application. Spring Boot ships with an embedded Tomcat server and lots of reasonable default configurations which make bootstrapping a simple application very easy. Of course you previously need to setup the project with your favorite dependency management system (Maven or Gradle) before you can get started, but this is also far from being difficult. Once you’re done, you can pack your entire application into a single JAR file and execute it from the command line. If you’re interested in the details of Spring Boot, I recommend you to take a look at the docs. Beyond that, the crucial factor for my decision to build on top of Spring Boot was that it already comes with built-in support for the Netflix OSS tools I intended to apply to my project. Spring Cloud Netflix offers these tools as individual module and significantly reduces the costs for integrating these into existing applications. I will go deeper into that during the next sections. The consumer service relies on the network to get in contact with the producer service. What might happen here is that no healthy producer instance is available or the entire network is down. Since I deployed both endpoints of the app within a single and rather reliable internal network, the latter might not be so probable. Nevertheless, the consumer must be prepared for getting no response from the producer side. In the case of our producer service which communicates with the remote OpenWeatherMap API over the internet, things are much more different. Because we don’t have any influence on the availability of any third party service, we always have to expect that servers are down just when we reach out to them. So what does that mean? Clearly, what we need is a way to make our services “fault tolerant”, which is especially true for our producer service which relies on a remote API on the internet. Above, I already introduced the Circuit Breaker Pattern and gave a short outline of what it is about. So let’s take a closer at that. Considering an electric circuit, a circuit breaker is a component which interrupts the circuit in case the amperage exceeds a certain limit. In this way, it protects the electrical loads within the circuit from being damaged. You might ask yourself: What does this scenario have in common with microservices? The answer is: Quite a lot, as you will see now. By default, application servers like Tomcat spawn a new thread for every incoming request. In case a thread has to wait for I/O (reading or writing to a database or file) or responses to network requests, it gets blocked by the operating system until the operation is finished. But what happens if the blocking operation takes long or doesn’t complete at all because the disk or the network is unavailable? Without further ado, actually nothing would happen, leaving the waiting thread suspended forever. One approach to deal with this is forgetting about the waiting thread and simply repeat the request, hoping that things go well this time. A new thread will be created and all operations will get started again. However, thinking of systems where thousands of requests per second rain down on a single service, this is not a great idea. You will finally end up with a huge mass of threads, all waiting for getting a job done which can’t be concluded as long as any other required service is unreachable. The server process allocates more and more memory and finally crashes. To make matters worse, even a single slow or unavailable server impacts the whole system since in turn other depending services will block, waiting for it to respond. In the end, your application will literally starve to death and finally come to a halt. Fail fast: If a remote service is slow or completely unavailable, a client requesting it can be returned an error message after a predefined timeout (e.g. 100 ms) has elapsed. Further requests will not be executed at all but immediately result in the same error message being returned by the circuit breaker. Fail silent: As an alternative, one could also return an empty response instead of an error message in case a remote service can’t be reached. The advantage of this approach is that a client might not event notice that a single service has crashed, particularly if the final result is composed of the responses of several remote calls (fan out). Custom Fallback: Instead of confronting a client with an error message or an empty response, we can also try to mitigate the outage of any service by determining an alternative behavior. For example, we could implement a fallback method which performs a cache lookup and provides the client with old data if possible. If that approach actually makes sense heavily depends on the use case. In all these cases, the circuit breaker is in “open” state, where it blocks all outgoing requests to a certain server in the network. In this way, it not only prevents depending services from starvation, but also gives the network or the remote server the change to possibly recover and return into operational state. Assuming that a crashed server reboots and comes to life again, the circuit breaker will gradually start to let requests pass instead of simply re-open the gate. Thereby, the restored server can be protected from instantly having to deal with a large amount of tasks, which might badly increase the risk of another crash. Add the @EnableCircuitBreaker annotation to the Spring Boot main class. For making a method being backed by Hystrix, supply it with the @HystrixCommand annotation. As indicated by the @HystrixCommand annotation, Hystrix is built upon the Command design pattern. Every method which has this annotation is wrapped by a command object and executed within a new thread while the original thread is blocked. In case a predefined timeout has elapsed (e.g. due to a unavailable remote service) all that Hystrix does is give back control to the original thread. From that moment on, we’re free decide how to continue. For my weather service, I determined to implement a fallback which performs a cache lookup and either returns the latest result for a certain zip code if available, or returns an empty response object. For the sake of simplicity, I used a java.util.HashMap per service instance as a volatile in-memory cache. In advanced scenarios, establishing a smarter solution based on Redis or Memcached that can be shared across multiple service instances and is not bound to the lifecycle of the applications makes much more sense. If there’s, for whatever reason, just a cached result available, the fallback method attaches a message to the result object telling the client that this result is actually out of date. With that in mind, he or she is free to repeat the request when the OpenWeatherMap API (hopefully) responds sooner or later. The same approach based on Hystrix is used in order to protect the weather consumer from a failing producer service. Services pass their network address to a service discovery and register them under a certain name. There can be more than one instance of a single service. Clients which want to reach out to a certain service can “lookup” its address by name at the service discovery. Thereby, they no longer have to be aware of the current network address which can even be changed without breaking clients. So what does Netflix OSS offer us here? Netflix released a service discovery solution named Eureka, which they use to coordinate their services deployed on the Amazon AWS cloud. Eureka also ships with Spring Cloud Netflix and can be used in the context of Spring Boot without much effort. There’s a couple of interesting this here. The first issue I ran into was that I didn’t turn off the Eureka server’s client behavior. It’s important to know that by default every Eureka server is also a Eureka client and searches for other Eureka peers after startup (this mode is calles “peer mode”). However, once again I decided on keeping thing simple and restrained the service discovery part to a single Eureka node running in standalone mode. Therefore, I fully disabled the client behavior by setting the appropriate attributes to “false” in the configuration file which starts Eureka in “standalone mode” and keeps it from from throwing exceptions on execution. Enhancing the producer service with Eureka client capabilities is also very easy and quite similar to the configuration we did for the server. As far as the app’s main class is concerned, the only change we have to apply is using the @EnableEurekaClient annotation instead of the corresponding server annotation. The first noticeable change is that we defined the server port of the producer app to be “0”. Actually, what this does is making Spring Boot select a random free port by itself. This is awesome in many ways because on the one hand, that spares us the effort to check a host for a free port manually if we’d like to start several instances of the producer service on a single host. Moreover, we actually don’t even care about port the producer application runs on because we don’t have to know about that. Since every producer registers with our service discovery, we can do a lookup and fetch the network address if necessary. You might have noticed that I address the host “eureka” within the serviceUrl attribute value. Once again, this keeps me from having to hard code an IP address, in this case the Eureka server host’s one. What allows me to address the Eureka server by name is a special networking feature provided by Docker. I will cover this later. Now that we’re able to start an arbitrary number of producer instances and register them with Eureka service discovery, the consumer service must be enabled to perform lookups thereby receive the network address of any available producer service. For that purpose, Spring Cloud offers a client API for hitting Eureka and fetching discovery data. The special thing about that API is that there’s no constraint to use it along with Eureka. If you prefer working with alternative service discovery tools like Apache ZooKeeper or Consul by HashiCorp, you’re free to do so. For my project, two reasons made me use Eureka: First, that allowed me to stay within the Netflix OSS ecosystem. Second, Eureka offers a very nice GUI which is more practical for demo purposes than e.g. the ZooKeeper CLI (which I still consider very handy). For my weather consumer service, I didn’t apply the standard DiscoveryClient implementation as described above. Instead, I chose to give Ribbon a try, which is a Netflix library for client-side load balancing. Note that this does not mean that there’s no load balancing offered by the DiscoveryClient class. However, it’s built-in load balancing capabilities are restricted to a naive round-robin approach, whereas Ribbon supports different load balancing rules, different protocols beyond HTTP (gRPC support is work in progress) and also caching. Using Ribbon is very simple: For my Spring Boot consumer, I simply put the required dependencies on classpath and added the @EnableEurekaClient annotation to the main class. Then, you can obtain a LoadBalancerClient instance from the Spring context via dependency injection. That’s it. From then on, we can ask the LoadBalancerClient instance for a remote service address by passing it the name of the service we want to hit. Ribbon fetches the list of available servers from Eureka, performs its load balancing magic and returns a single ServiceInstance object, which contains IP address and port which can in turn be used to setup an HTTP request. Since reaching out to RESTful APIs via HTTP often results in boilerplate code, Spring Cloud also integrates Feign, a library which aims at keeping developers from writing the same code for speaking with remote APIs over and over again. Its approach is completely declarative, meaning that all that’s left to the user is creating an Interface which provides the signature for the remote call. Using that as a basis, Feign cares about generating the application code on the fly and passing to the client. Although I think that using Feign can help building clean and slight applications, I resigned to integrate it into my project. The reason for that simply is that in my opinion implementing remote calls in a verbose way instead of abstracting things away behind Feign provides a much better demo of what’s really going on and helps to understand the steps which are performed (reaching out to service discovery, doing client-side load balancing, sending HTTP request). In a productive environment, using Feign would of course be a reasonable choice. At least, I ran some tests to see if my application was actually as resilient as I expected it to be. I interrupted the network connection between consumer and producer and between producer and the Internet respectively and watched the behavior of my consumer service. 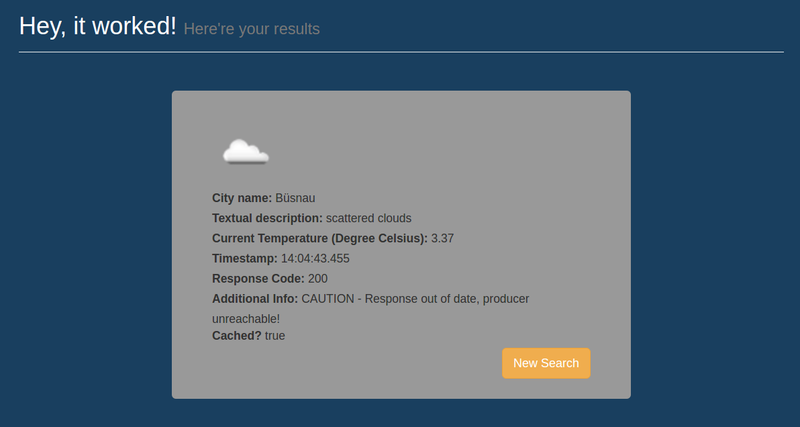 As you can see in the following screenshot, the consumer service serves an outdated response from its cache if the producer service is not available or there’s no connection between them. The producer service does exactly the same thing in case it can’t access the OpenWeatherMap API. Figure 4: The consumer service informs the user that the remote service is not available and serves an outdated response as a fallback. At this point, I guess you have a rough impression of the tools I used as well as the decisions I made for my distributed demo application. The next step was developing a strategy for bringing the single services to the Docker cluster which, as I already mentioned at the beginning, already existed and was the motivation for doing this project anyway. 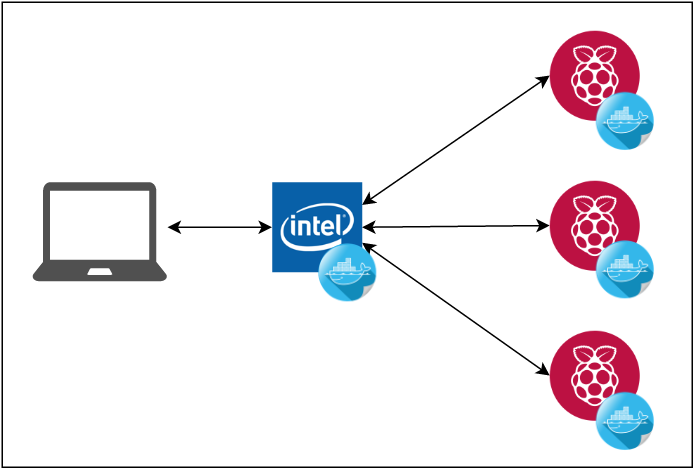 The existing Docker cluster consisted of six RaspberryPis as well as a single Intel NUC. The OS driving the Pis was Hypriot Version 0.5 “Will” (I really like these guys for their references on Pirates of the Caribbean). On the NUC, we setup Debian “Jessie”. On the Pis as well as the NUC, we started with Docker Engine version 1.8.2, Docker Machine 0.4.1 and Docker Swarm 0.4.0. HypriotOS Linux kernel was 4.1.8. We established a Docker swarm, with the NUC as the master node and the RaspberryPis as a cluster of worker nodes. On top of that, the NUC as the swarm master node also ran Shipyard, which provides a very nice GUI for Docker container and swarm management. After having installed updates on every cluster node, the Intel NUC suddenly was on Docker 1.12. At the same time, I couldn’t get beyond Docker 1.10 with the Hypriot version running on the Pi cluster. As a consequence, building on top the new swarm mode which came with Docker Engine 1.12 was not possible in my case. I also realized there wasn’t full backward compatibility between the Docker Machine versions on the NUC and the Pis after the update. In the meantime, Docker launched a new version of their image registry. This was not so good for me since the Shipyard release running on the NUC did not support the new API. Just to make things clear: My original schedule for the project didn’t respect the costs of setting up the entire cluster from scratch, including flashing every single Pi with the latest Hypriot release. Although that would have been the best approach in my opinion in order to start with a proper setup, I decided to live with that and make the best out of it. Unfortunately, I had almost finished the project when I learned that replacing the existing Docker installation on the Pis with the Raspbian release could have mitigated my problems (at this point, thanks to Hypriot team member Dieter Reuter). You see that this Dockerfile is actually very simple. All it does is taking the JAR from the target directory (after the build), copy it into the image along with the OpenWeatherMap API key and finally start it up as soon as a container is created from that image. I won’t go into the Dockerfiles for the consumer service as well as the Eureka service, since they look almost the same. Note that I set up my own Docker Registry on the Intel NUC, that’s why the I address the Docker images with the “localhost:5000” prefix here. As soon as I shipped my services to the cluster for the first time, everything seemed to work well. All containers came up, the producer services registered themselves with Eureka and were ready to get looked up by the consumer service. So far, so good. But although the consumer app was able to do lookups, no producer instance could be reached and I got was “connection refused” error messages. Something was definitely wrong. Shortly afterwards, it began to on me when I recognized that all the producer services running on the Pi cluster published a 172.17.0.x IP address to Eureka, although the hosts within were statically assigned an internal IP address from the range 141.62.66.x. make the producers writing their host’s public IP address into the service discovery, which was not so easy because the containerized apps had no idea of the host’s network interfaces. Everything they saw was docker0. When discussing that problem with Docker Captain Alex Ellis (@alexellisuk) at Docker Distributed Systems Summit in Berlin, he told me about a Docker networking feature called “overlay network”. In short, this allows for defining container networks which can span multiple Docker hosts. On top of that, you get DNS for free, meaning that every container within the overlay network can be reached by a network alias. In case there’re several containers with the same alias, you also get fully transparent load balancing (to understand load balancing in Docker in depth, this is a great place to start in my opinion). This exactly sounded like the solution to my problem! I downloaded and installed (Apache ZooKeeper)[https://zookeeper.apache.org] on the NUC in order to provide the necessary key-value store which for getting started with multi-host networking. By the way, needless to say you can also use a Docker container to do this ;). Afterwards, I restarted the Docker daemons and checked if they properly registered with ZooKeeper. From the consumer service’s perspective, an arbitrary producer microservice could now be reached by searching for a “producer” within the overlay network. If you think carefully about that, you might notice that having Eureka as a service discovery was no longer necessary at this point, since the overlay network already resolved the “producer” alias to the IP address wanted and therefore de facto eliminated the need for any external service discovery. But again, since I planned to use the Eureka GUI for demo purposes, I decided to keep it and use the overlay network for addressing the Eureka server by its container alias “eureka”, which spared me the need to hard code the IP within the consumer service. Besides container DNS, the overlay network gave me what was most important to me: Valid IP addresses across the whole cluster. So, every app published an IP from the range 10.0.9.x to Eureka after it’s container had joined the overlay network. In a productive environment, resigning the additional round trip introduced by the external service discovery and relying on Docker DNS as well as load balancing instead might be reasonable due to performance reasons. A Jenkins CI server checks out the source code from Github and triggers a Maven build. 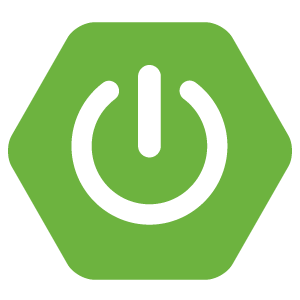 At first, Maven compiles the code and packages everything up as a JAR file by means of the Spring Boot Maven Plugin. 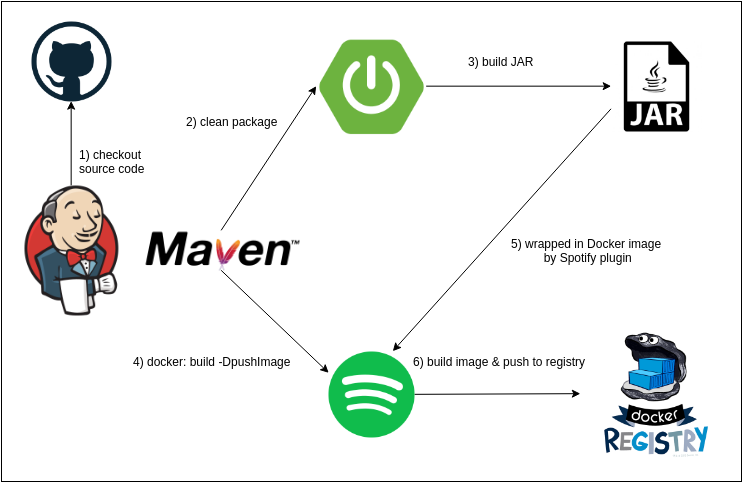 Subsequently, the Spotify Docker-Maven-Plugin is used to build a Docker image based on a Dockerfile within the project’s root directory. After a successful Docker build, the Spotify Docker-Maven Plugin also takes care of pushing the resulting image to a Docker registry. That’s exactly what I did on the Intel NUC to configure a private registry for my microservices images. Building a JAR file which can be launched from the command line usually requires some extra work. You need to create a MANIFEST file, use it to define the main class whose main method shall be executed on startup, include the resources the application needs for execution (e.g. configuration files) and finally package everything up into a single archive. If you use Gradle or Maven for build management, there’re plugins which let you integrate this procedure into the build process, but all these information must still be provided. This is where the Spring Boot Maven plugin comes very handy. All you have to do is add it to your pom.xml file. The plugin will do its job as soon as the package goal gets executed. The resulting JAR contains everything that’s needed for running a Spring Boot based webapp. Simply do java -jar myWebapp.jar and give it a try. Note that the pushImage flag is optional and can be omitted if for some reason the resulting image shall not be pushed after the build. Checking out the source code from Github. I already covered what exactly happens when the package and docker:build Maven goals get executed so I won’t go further into that. So, I appreciate that this was lots of information on many different tools and frameworks condensed within a single blog post. However, I think it has been a valuable experience for me to build my own mircoservices development and deployment stack from scratch by “plumbing” different components and libraries into a fully functional software and system architecture. In doing so, I didn’t want to copy any existing and well-proven pipelines,but rather focused on finding the tool which does things the way I wanted it to be. Consumer service and producers communicate via RESTful HTTP. Although that does the job, relying on HTTP with all its headers and metadata for service-to-service communication introduces lots of overhead in the backend. As an alternative, using gRPC by Google allows for doing remote calls by means of a binary protocol with a minimal foot print. This article is a review of a talk given by Uber Chief Systems Architect Matt Ranney, who also discusses that in depth. Using gRPC as a communication protocol would further allow for implementing services in other languages than these running on JVM. However, that would also mean that some research must be done on which circuit breaker implementations of service discovery clients are available for a certain language. By putting all the build steps (compiling, image creation) in a single Maven build, the whole build fails if e.g. for some reason the image can’t be pushed to the image repository and must be started from scratch. Splitting up the process into several more or less independent steps might make sense in this case. I already mentioned the problems I had when updating Docker on my cluster. Nevertheless, bringing all Docker Engines within the cluster to at least Docker 1.12 would make comfortable deployment of containers much more easier and would also allow me to take advantage of the latest Swarm Mode features introduced with that version. As you can see, there’s still plenty of work to do and the project is far from being finished. If you like this post or want to grant me some feedback, feel free to contact me on Twitter. The source code of my project can be found on Github. Netflix, Inc. (2016). How to Use. [online] Available at: https://github.com/Netflix/Hystrix/wiki/How-To-Use [Accessed 04 Dec. 2016]. Netflix, Inc. (2016). Netflix/eureka. [online] Available at: https://github.com/Netflix/eureka [Accessed 05 Dec. 2016]. Netflix, Inc. (2016). Netflix/Hystrix. [online] Available at: https://github.com/Netflix/Hystrix [Accessed 05 Dec. 2016]. Netflix, Inc. (2016). Netflix/ribbon. [online] Available at: https://github.com/Netflix/ribbon [Accessed 11 Dec. 2016].